Newcastle mum, Melissa Dean, had a relatively uneventful pregnancy, her baby was growing beautifully and she was fit and well. It wasn’t until the final weeks of pregnancy that things started to get interesting. Melissa’s baby wasn’t head down and ready for birth but instead sitting with her bottom facing the birth canal – a typical breech birth position. As this was Melissa’s first pregnancy it was not an ideal position to be in, but as a midwife herself she had enough knowledge to feel confident that she could birth this baby naturally, but she would need to get her head in the game. The mum-to-be attended the Breech Clinic at John Hunter Hospital where they went over every detail and decided that she fitted the criteria to attempt a natural breech delivery. There was a chance this plan wouldn’t eventuate as any number of factors could have arisen, but with the unwavering support of her wonderful husband Ben, she decided to at least try for the natural birth she had envisaged all throughout her pregnancy. 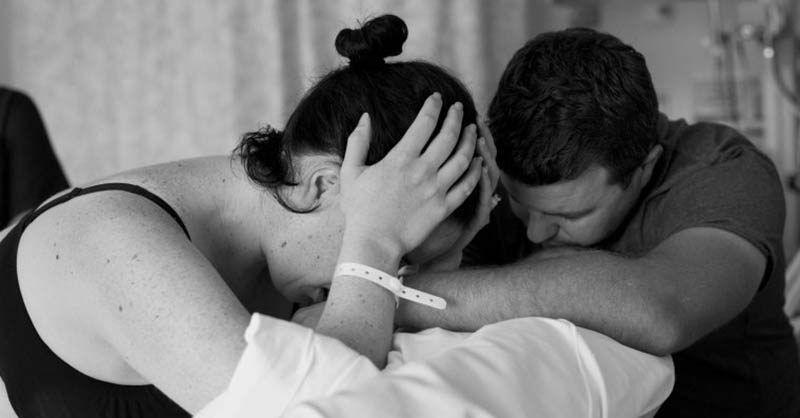 Melissa, Ben and her photographer Kate of Kate Kennedy Birth Photography decided to share the incredible images below of the birth in the hope that they might inspire a healthier way of thinking around natural breech birth. For Melissa to achieve a natural birth she could not be induced and needed labour to begin spontaneously, but she remained calm and trusting of her body and baby as she passed the 41 week mark. Finally baby Zoe decided on the 10th of April, that it was the perfect day to meet her parents.